Take a full database backup for the web application content databases. Prepare Project Server 2013 farm. Take a full database backup for the following database to enable the rollback if the migration process failed. WSS_Content. (The web application Content Database). WSS_Content_PWA. (In case of you are using an independent Content Database for PWA Instance). Dismount Project Web App Instance. Dismount PWA Instance Content Database. Dismount Web Application Content Databases. Restore the source databases backup. Deploy your custom WSP solution if exist. Change the site collection administrator. Perform a Bulk Update connected SharePoint sites. Update Project Server Cube settings. (1) Specify the web application content databases. In my case, I have two content databases. WSS_Content. (The Main web application Content Database). WSS_Content_PWA. (An independent Content Database for PWA Instance). (2) Specify the PWA instance with its ‘Project Web App‘ database. (3) Take a full database backup for the ‘Project Web App‘ database. Connect to the SQL Server instance. Right click on Database name > Tasks > Back Up. Ensure Backup type is Full > Disk > Select the back up path > OK. Backup has been taken successfully. (4) Take a full database backup for the web application content databases. Once you have finished, check the backup path to make sure that the required databases backup has been taken as shown below. (5) Backup all the deployed SharePoint solutions (WSP) in your farm if exist. Create a ‘WSPSolutions’ folder at any location. Run the below cmdlets to backup all the deployed WSP solution in your farm. Install and Configure SharePoint Server 2013 with SP1 Enterprise Edition. Install Project Server 2013 with SP1. Install the latest Cumulative Update that already installed in source farm. Install the corresponding Language Pack that already installed in source farm. Create a Web Application and Site Collection. Provision a Project Server Application Service. Lockdown the content database if you are using an independent content database for PWA in source farm. For more details check Content Database Consideration during the provision of a new PWA Instance In Project Server 2013. (2) Take a full database backup. (3) Dismount the Project Web Instance as mentioned below. Run the below cmdlet to get all provisioned PWA instances on the farm. You can also get the provisioned PWA instances via Central Administration as mentioned below. Open Central Administration > Application Managemet. Click on Mange Service Application. Click on PWA service application to show all the PWA instances that already provisioned in the farm. 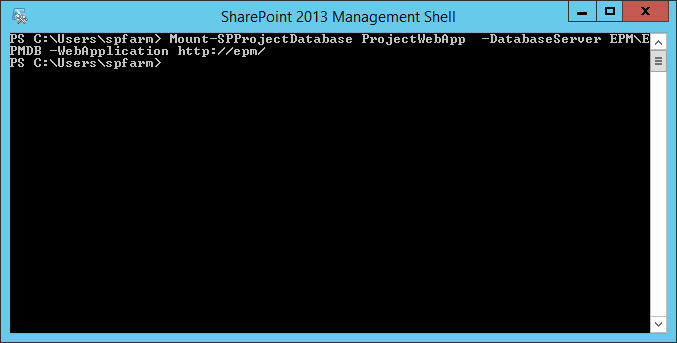 Dismount the existing Project Web Instance to disconnect the SharePoint site collection from the Project Web App database by running the below cmdlet. You should now note that the PWA instance has been removed in the Central Administration > Manage PWA. (4) Dismount PWA Instance Content Database. Dismount the PWA content databases from its currently associated web application that host the PWA instance. Perform a ‘Dismount-SPContentDatabase‘ for the PWA content database. The Dismount-SPContentDatabase cmdlet detaches the content database from the Web application, but it does not delete the content database from SQL Server.but it does not delete the content database from SQL Server. (5) Dismount web application Content Databases. Again, Dismount the ‘WSS_Content’ Content Database. The Content Database is now dismounted successfully as shown below. (6) Restore the source databases backup. Move the databases backup from the source farm to appropriate path in SQL Server of the destination farm. Open the SQL Server Management Studio > Connect to your instance. Perform the restore operation for each database as shown below. A tail-log backup is unnecessary if you are moving or replacing (overwriting) a database. Repeat the above steps for other databases. (7) Mount ‘WSS_Content’ content database. Run the ‘Mount-SPContentDatabase’ for ‘WSS_Content’ database to attach it to its web application that host the PWA instance. (8) Mount ‘WSS_Content_PWA’ content database. Again, Mount ‘WSS_Content_PWA’ database to the web application that host the PWA instance. (9) Mount ‘ProjectWebApp’ project database. Now you should Mount the ‘ProjectWebApp’ database to the web application that host your PWA instance. (10) Mount the PWA Instance. Mount the PWA Instance to associate the PWA site collection to its Project Web App database. Go back to central administration > to make sure that the PWA Instance has been mounted and provisioned successfully. (11) Deploy your custom WSP solution if exist. Paste DLL’s to the ‘bin‘ folder of destination web application. Make sure that the solutions have been deployed successfully by going to. Central Administration > System Settings > Manage Farm Solution. (12) Change the site collection administrator. To avoid the below access permission issue. Open Central Administration > Application Management > Change Site Collection Administrators > Select your Web Application > Select the PWA site collection. Remove the old site collection administrator then add the new site collection administrator of the current farm. (13) Change PWA Instance Administrator. Open Central Administration > Application Management > Manage Service Application. Click on PWA service application to show the provisioned PWA instances. Edit yourPWA instance as shown below. Provide the New PWA instance administrator. (14) Perform a Bulk Update connected SharePoint sites. Go to Central Administration > General Application Settings > PWA Settings > Manage. Go to Central Administration > General Application Settings > PWA Settings > Manage > OLAP Database Management. Well explained . Very nice way of knowledge sharing.